PDT110A modules, at a height of 3.2 inches and a diameter of 1.55 inches, are our most popular neutron monitoring products. PDT110A modules provide simplicity of use yet versatility of operation. Each module contains a charge-sensitive preamplifier, an amplifier, and a discriminator. PDT110A modules interface directly to HN connectors, allowing direct connection to gas-filled detectors. When a neutron event occurs within the detector, the charge-sensitive preamplifier captures the signal resulting from the neutron event. The PDT110A further amplifies, integrates, and differentiates the signal. The discriminator produces a TTL pulse channeled to the output connector labeled "TTL OUT." PDT110A modules provide versatility, allowing control of amplifier sensitivity and the TTL output pulse width. Additional features include digital pulse summing, an LED for visual indication of neutron event monitoring, and a test point for analog monitoring of the signal resulting from the neutron event. Power supply cable"Vcc" (+5 volts or +12 volt are factory options. High voltage bias supply input cable "HV IN". Output pulse cable to coincidence counter "TTL OUT"
The monitoring of neutron events begins by attaching a PDT110A to a gas-filled detector with a standard HN connector interface (most BF-3 and Helium-3 detectors have standard HN connectors), applying a +5 volt cable to the "+Vcc" power input, and connecting the bias cable to the "HV IN" input. Simply attach a 50-ohm coaxial cable to your monitoring equipment (coincidence counter) and the "TTL OUT" connector of the PDT110A. With your setup task complete, applying power begins the process of neutron event monitoring. PDT110A modules are versatile, allowing for the summing of multiple detectors. 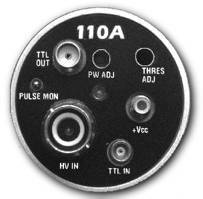 The output pulse of any PDT110A module can be summed directly into another PDT110A module, thereby allowing digital pulse summing of several detectors. A 12-turn trimpot controls the Amplifier sensitivity,"THRES ADJ"
A trimpot controls the "TTL OUT" pulse width, "PW ADJ"
To order the correct cable kits or specific customized cables, see our line of cable products. "TTL IN"-- µCoax Receptacle ------- Standard TTL input signal used for digital pulse summing between PDT110A modules. "TTL OUT" --SMA Connector ------- TTL output designed to interface to another PDT110A or to your coincidence counter. Digital pulse summing allows users to sum the digital pulses between PDT110A modules. The "TTL OUT" pulse from one PDT110A module is cabled to the "TTL IN" input connector of a second PDT110A module. Each module sums the pulses of the "TTL IN" with the pulses obtained from the detector it is monitoring. If a TTL signal is not applied to the "TTL IN" input connector, no summing action occurs. The benefit of summing digital pulses is that only one signal cable route is needed to the neutron coincidence counter. The TTL pulse width is factory set to 50nS; however, the user has the ability to change the pulse width from 50nS to 500nS. The amplifier sensitivity can be changed by the user but is set at the factory to achieve good plateau results for a bias voltage setting of 1800 volts when using helium-3 detectors. During operation, when a neutron event occurs within the detector, the charge-sensitive preamplifier captures the signal resulting from the neutron event. The signal is further amplified, integrated and differentiated and a TTL pulse produced by the discriminator is delivered to the output connector labeled "TTL OUT." PDT110A modules provide additional versatility to the user by allowing user control of both the amplifier sensitivity and the pulse width. Generally, the factory setting of the sensitivity is sufficient to provide good HV plateau curves when 1800 volts is applied to the SHV "HV IN" input connector using helium-3 neutron detectors. However, when other detector types are used, or if the HV bias settings can not be varied, users can adjust the amplifier sensitivity and achieve good plateau results by adjusting the trimpot labeled "THRES ADJ." The "TTL OUT" digital pulse adjusts over a range of 50nS to 500nS by varying the trimpot located beneath the hole labeled "PW ADJ." Other features that PDT110 modules provide are digital pulse summing, an LED that provides a visual indication of detected events, and a test point labeled "PULSE MON," which allows users to view the analog pulse at the output of the amplifier. Many applications require the "TTL OUT" signal to drive coaxial cables in excess of hundreds of meters. PDT series 100A, 110A and 120A modules provide a standard TTL output or a TTL output engineered with 50-ohm transmission line driver, capable of supporting extended cable lengths. PDT110A modules provide three input connectors: DETECTOR PIN, "TTL IN", and "+Vcc"
Connector: Located at the bottom of module, the detector pin connects directly to any HN family type connector. Threshold: PDT110A modules provide a nominal threshold of .02pCoulombs referred to the input . For increased sensitivity, contact the factory for desired specifications. For monitoring low level events, the threshold can be increased five-fold as a special order from the factory. Threshold Control: Control variability is 20:1 using a 12-turn trimpot located beneath the hole labeled "THRES ADJ" shown on the decal on top of the module. Stability: +/-5% of 25 degree Centigrade, 0 to 50 degree Centigrade. Purpose: TTL signals applied to this input are logically OR'ed with the signal that is measured at the detector pin. If no signal is applied (the input is left open), no summing action occurs. Connecting +5V to this input will inhibit pulses from the "TTL OUT" connector. Typically 30mA for zero count rates, and for count rates in excess of 100,000 measured by the detector pin, the supply current is typically 40mA. For +5 volt operation, the voltage range is 4.75 volt to 6.5 volts. For +12 volt supply operation, the voltage range is 9 volts to 18 volts. For +12volt supplies, the typical current is 60% of the +5 volt typical specifications. The "TTL OUT" signal consists of a transmission 50-ohm line drive designed to drive coaxial cables of long lengths, in excess of 100 meters. If driving long cables is not an issue. For systems requiring lower power, request a standard TTL output. The "TTL OUT" signal connects directly to a coincidence counter or into the "TTL IN" input connector of another PDT110A module for cascaded operation. TTL signals applied to this input are logically OR'ed with the signal measured at the detector pin. If no signal is applied (the input is left open), then no summing action occurs. Connecting +5V to this input will prevent pulses from leaving the "TTL OUT" connector.